On Saturday Night, I attended Ivy League Friend's (and his Sister School Girlfriend's) Holiday Party. It was A Fun, Festive Affair, featuring A Perry Como Christmas and A Big Turkey and Wonderful, Delicious, Vodka Filled Dark Chocolates. The Chocolates were Awesome, but I probably just think that because I brought them. At The Party, I caught sight of A Boy staring at me from across the room. And he looked Really Familiar. Instantly, I tried to recall where I knew him from. What was Odd was that I associated him with A Really Bad On-Line Date and/or Stabbing Pain. It really could have been Either/Or. Or Both. "Shabby!" I staged whispered as I tugged on The Christmas Crinoline she was wearing under her Made-To-Look-Like-It-Could-Be-Vintage-But-Was-Actually-Designer-And-Cost-Twice-As-Much-Dress. "See That Guy? I know him! How?" After a while, all The Bad Dates Blend One Into Another in my head and I depend on Shabby to Sort Them Out. "Oh!" she said. "I know him, too. Hmmmm." I could tell she was a bit Stumped, so I helped her out. "I associate him with something Really Bad." I added. Shabby remembered, "I think we met him at Ivy League Friend's Holiday Party last year...Didn't we?" And just as she said that, Curiously Familiar Boy said, "Hi!" He continued, "We met last year! At Christmas! Your name is Shabby, isn't it?!" "Wow. How do you remember that--" stammered Shabby. 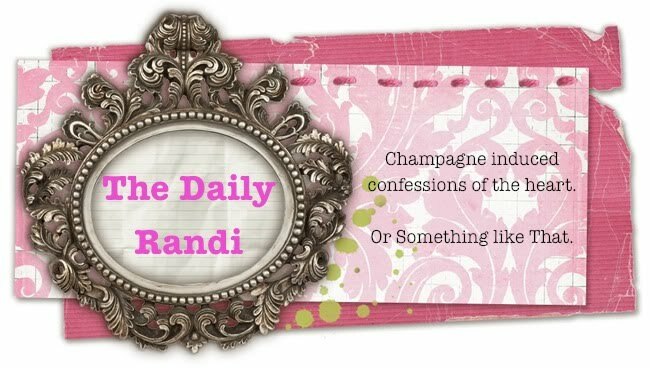 As he turned to me and announced, "And you are The Daily Randi," it All Came Flooding Back To Me like A Horrible, God Awful, Stabbing Pain And Ulcer Infused Nightmare. This was The Guy We Met Last Year who Wouldn't Leave Shabby Alone and then She Stuck Him On Me and Then I Couldn't Get Rid Of Him and I was Stuck at A Corner Table and Couldn't Get Out, unless I Crawled Out, and I kept shooting Nasty, Pleading, Emergency, Save-Me-Please Looks At Shabby while all the while trying to Remain Polite and My Only Out came when I suddenly announced, "Where's The Bathroom, I am going to be Sick! Hurry, You need to Move!!" but then just went to The Bar and Celebrated My Escape with A Refreshing Glass Of Champagne Punch. Curiously Familiar Boy walked over, as if to Chat With Me. I Schemed as Quickly as I could. "Where's The Bathroom? We are Going To Be Sick!" I shouted, pulling Shabby into the other room. And then, naturally, Shabby and I Celebrated Our Apparently Annual Escape with Two Refreshing Glasses of Champagne Punch. Another Christmas, Another Boy Who Won't Leave The Two Of Us Alone! Eh, well, maybe, it's just Another Christmas. Unfortunately, it Always Seems To Be The Same Awful, Horrible Boy.